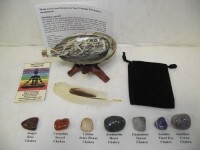 Kits for smudging and smudging ceremonies for aromatherapy and removing negative energy and spirits from persons or places using sage or herbs in combination with an abalone shell and smudging feather fan. 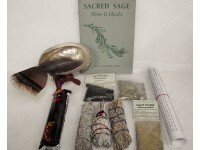 Made in the USA Sage N Smudge TM Chakra smudging kits plus includes: 1 natural abalone shell 4 to.. 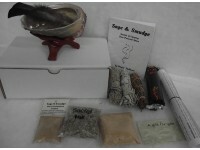 This is a house cleansing blessing smudge gift set great for a new house or a gift for a friend. Com.. 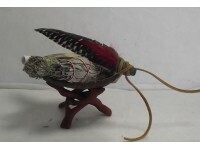 This travel kit includes: 1 BEAUTIFUL ABALONE SHELL ABOUT 2 TO 3 INCHES 1 SMALL WILD TURKEY FEAT.. 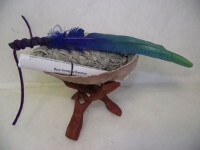 This is a smudge kit with a 5 to 7 inch Abalone shell, shell stand, hand made Blue Green smudging fe.. 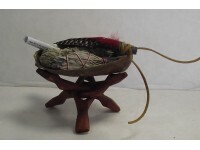 This is a smudge kit with a 4 to 5 inch Abalone shell, wooden stand, a hand made Painted Eagle and R.. 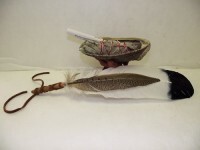 THIS SMUDGING KIT INCLUDES: 1 LARGE NATURAL ABALONE SHELL 5 to 7 INCHES 1 FOLDING TRIPOD S.. 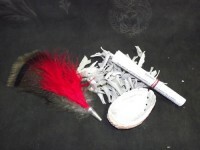 THIS SMUDGING KIT INCLUDES: 1 LARGE NATURAL ABALONE SHELL 4 to 5 INCHES 1 FOLDING TRIPOD S..